In this tutorial we discuss many, but certainly not all, features of scipy.stats. The intention here is to provide a user with a working knowledge of this package. We refer to the reference manual for further details. Note: This documentation is work in progress. There are two general distribution classes that have been implemented for encapsulating continuous random variables and discrete random variables . Over 80 continuous random variables (RVs) and 10 discrete random variables have been implemented using these classes. Besides this, new routines and distributions can easily added by the end user. (If you create one, please contribute it). All of the statistics functions are located in the sub-package scipy.stats and a fairly complete listing of these functions can be obtained using info(stats). The list of the random variables available can also be obtained from the docstring for the stats sub-package. In the discussion below we mostly focus on continuous RVs. Nearly all applies to discrete variables also, but we point out some differences here: Specific Points for Discrete Distributions. We can list all methods and properties of the distribution with dir(norm). As it turns out, some of the methods are private methods although they are not named as such (their name does not start with a leading underscore), for example veccdf, are only available for internal calculation (those methods will give warnings when one tries to use them, and will be removed at some point). To obtain the real main methods, we list the methods of the frozen distribution. (We explain the meaning of a frozen distribution below). Let’s take a normal RV as an example. To compute the cdf at a number of points, we can pass a list or a numpy array. Thus, the basic methods such as pdf, cdf, and so on are vectorized with np.vectorize. This brings us, in fact, to the topic of the next subsection. All continuous distributions take loc and scale as keyword parameters to adjust the location and scale of the distribution, e.g. for the standard normal distribution the location is the mean and the scale is the standard deviation. In general the standardized distribution for a random variable X is obtained through the transformation (X - loc) / scale. The default values are loc = 0 and scale = 1. By applying the scaling rule above, it can be seen that by taking scale = 1./lambda we get the proper scale. 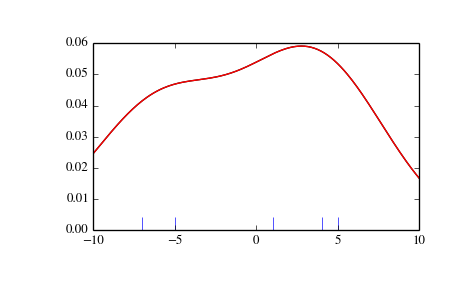 Thus, to explain the output of the example of the last section: norm.rvs(5) generates a normally distributed random variate with mean loc=5. I prefer to set the loc and scale parameter explicitly, by passing the values as keywords rather than as arguments. This is less of a hassle as it may seem. We clarify this below when we explain the topic of freezing a RV. requires the shape parameter \(a\). Observe that setting \(\lambda\) can be obtained by setting the scale keyword to \(1/\lambda\). Now we set the value of the shape variable to 1 to obtain the exponential distribution, so that we compare easily whether we get the results we expect. Passing the loc and scale keywords time and again can become quite bothersome. The concept of freezing a RV is used to solve such problems. This is indeed what we should get. The basic methods pdf and so on satisfy the usual numpy broadcasting rules. For example, we can calculate the critical values for the upper tail of the t distribution for different probabilites and degrees of freedom. Discrete distribution have mostly the same basic methods as the continuous distributions. 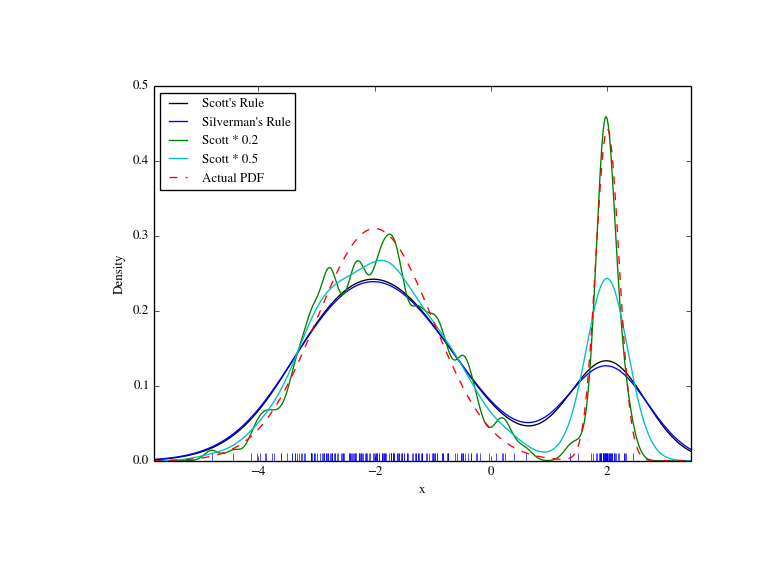 However pdf is replaced the probability mass function pmf, no estimation methods, such as fit, are available, and scale is not a valid keyword parameter. The location parameter, keyword loc can still be used to shift the distribution. For further info, see the docs here. The performance of the individual methods, in terms of speed, varies widely by distribution and method. The results of a method are obtained in one of two ways: either by explicit calculation, or by a generic algorithm that is independent of the specific distribution. Explicit calculation, on the one hand, requires that the method is directly specified for the given distribution, either through analytic formulas or through special functions in scipy.special or numpy.random for rvs. These are usually relatively fast calculations. The generic methods, on the other hand, are used if the distribution does not specify any explicit calculation. 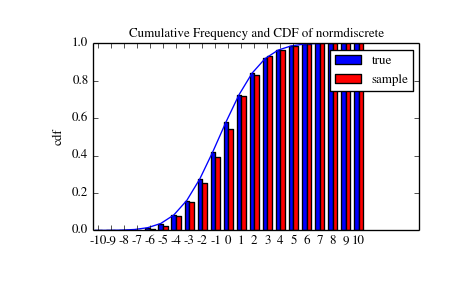 To define a distribution, only one of pdf or cdf is necessary; all other methods can be derived using numeric integration and root finding. However, these indirect methods can be very slow. As an example, rgh = stats.gausshyper.rvs(0.5, 2, 2, 2, size=100) creates random variables in a very indirect way and takes about 19 seconds for 100 random variables on my computer, while one million random variables from the standard normal or from the t distribution take just above one second. the distributions have been tested over some range of parameters, however in some corner ranges, a few incorrect results may remain. the maximum likelihood estimation in fit does not work with default starting parameters for all distributions and the user needs to supply good starting parameters. Also, for some distribution using a maximum likelihood estimator might inherently not be the best choice. The next examples shows how to build your own distributions. Further examples show the usage of the distributions and some statistical tests. Making continuous distributions is fairly simple. ...         return 0., 0., 0., 0. This looks better. However, the problem originated from the fact that the pdf is not specified in the class definition of the deterministic distribution. 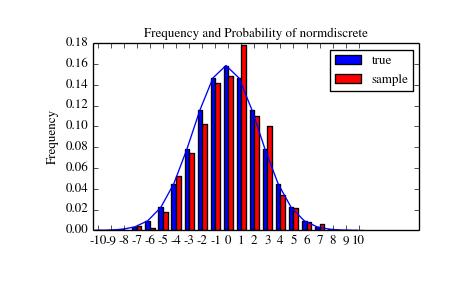 In the following we use stats.rv_discrete to generate a discrete distribution that has the probabilities of the truncated normal for the intervals centered around the integers. The keyword name is required. The support points of the distribution xk have to be integers. The number of significant digits (decimals) needs to be specified. In fact, if the last two requirements are not satisfied an exception may be raised or the resulting numbers may be incorrect. Now that we have defined the distribution, we have access to all common methods of discrete distributions. Let’s generate a random sample and compare observed frequencies with the probabilities. Next, we can test, whether our sample was generated by our normdiscrete distribution. This also verifies whether the random numbers are generated correctly. The chisquare test requires that there are a minimum number of observations in each bin. We combine the tail bins into larger bins so that they contain enough observations. The pvalue in this case is high, so we can be quite confident that our random sample was actually generated by the distribution. Here, we set the required shape parameter of the t distribution, which in statistics corresponds to the degrees of freedom, to 10. Using size=1000 means that our sample consists of 1000 independently drawn (pseudo) random numbers. Since we did not specify the keyword arguments loc and scale, those are set to their default values zero and one. x is a numpy array, and we have direct access to all array methods, e.g. How do the some sample properties compare to their theoretical counterparts? Note: stats.describe uses the unbiased estimator for the variance, while np.var is the biased estimator. For our sample the sample statistics differ a by a small amount from their theoretical counterparts. We can use the t-test to test whether the mean of our sample differs in a statistcally significant way from the theoretical expectation. The pvalue is 0.7, this means that with an alpha error of, for example, 10%, we cannot reject the hypothesis that the sample mean is equal to zero, the expectation of the standard t-distribution. Again the p-value is high enough that we cannot reject the hypothesis that the random sample really is distributed according to the t-distribution. In real applications, we don’t know what the underlying distribution is. If we perform the Kolmogorov-Smirnov test of our sample against the standard normal distribution, then we also cannot reject the hypothesis that our sample was generated by the normal distribution given that in this example the p-value is almost 40%. However, the standard normal distribution has a variance of 1, while our sample has a variance of 1.29. If we standardize our sample and test it against the normal distribution, then the p-value is again large enough that we cannot reject the hypothesis that the sample came form the normal distribution. Note: The Kolmogorov-Smirnov test assumes that we test against a distribution with given parameters, since in the last case we estimated mean and variance, this assumption is violated, and the distribution of the test statistic on which the p-value is based, is not correct. In all three cases, our sample has more weight in the top tail than the underlying distribution. We can briefly check a larger sample to see if we get a closer match. In this case the empirical frequency is quite close to the theoretical probability, but if we repeat this several times the fluctuations are still pretty large. The chisquare test can be used to test, whether for a finite number of bins, the observed frequencies differ significantly from the probabilites of the hypothesized distribution. 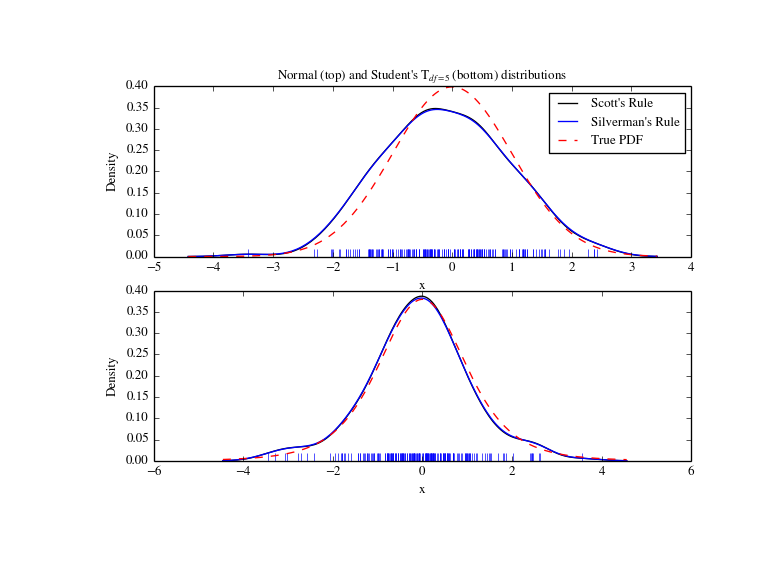 We see that the standard normal distribution is clearly rejected while the standard t-distribution cannot be rejected. Since the variance of our sample differs from both standard distribution, we can again redo the test taking the estimate for scale and location into account. The fit method of the distributions can be used to estimate the parameters of the distribution, and the test is repeated using probabilites of the estimated distribution. Taking account of the estimated parameters, we can still reject the hypothesis that our sample came from a normal distribution (at the 5% level), but again, with a p-value of 0.95, we cannot reject the t distribution. In all three tests the p-values are very low and we can reject the hypothesis that the our sample has skew and kurtosis of the normal distribution. When testing for normality of a small sample of t-distributed observations and a large sample of normal distributed observation, then in neither case can we reject the null hypothesis that the sample comes from a normal distribution. In the first case this is because the test is not powerful enough to distinguish a t and a normally distributed random variable in a small sample. In the following, we are given two samples, which can come either from the same or from different distribution, and we want to test whether these samples have the same statistical properties. A common task in statistics is to estimate the probability density function (PDF) of a random variable from a set of data samples. This task is called density estimation. The most well-known tool to do this is the histogram. A histogram is a useful tool for visualization (mainly because everyone understands it), but doesn’t use the available data very efficiently. Kernel density estimation (KDE) is a more efficient tool for the same task. The gaussian_kde estimator can be used to estimate the PDF of univariate as well as multivariate data. It works best if the data is unimodal. We see that there is very little difference between Scott’s Rule and Silverman’s Rule, and that the bandwidth selection with a limited amount of data is probably a bit too wide. We can define our own bandwidth function to get a less smoothed out result. ...     """We use Scott's Rule, multiplied by a constant factor.""" We see that if we set bandwidth to be very narrow, the obtained estimate for the probability density function (PDF) is simply the sum of Gaussians around each data point. We now take a more realistic example, and look at the difference between the two available bandwidth selection rules. Those rules are known to work well for (close to) normal distributions, but even for unimodal distributions that are quite strongly non-normal they work reasonably well. As a non-normal distribution we take a Student’s T distribution with 5 degrees of freedom. 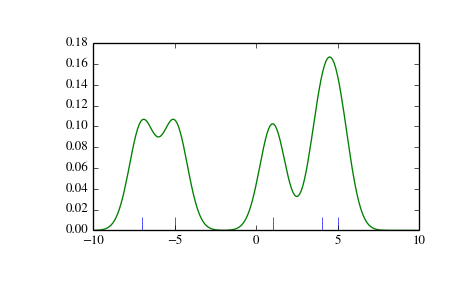 We now take a look at a bimodal distribution with one wider and one narrower Gaussian feature. We expect that this will be a more difficult density to approximate, due to the different bandwidths required to accurately resolve each feature. As expected, the KDE is not as close to the true PDF as we would like due to the different characteristic size of the two features of the bimodal distribution. By halving the default bandwidth (Scott * 0.5) we can do somewhat better, while using a factor 5 smaller bandwidth than the default doesn’t smooth enough. What we really need though in this case is a non-uniform (adaptive) bandwidth. With gaussian_kde we can perform multivariate as well as univariate estimation. We demonstrate the bivariate case. 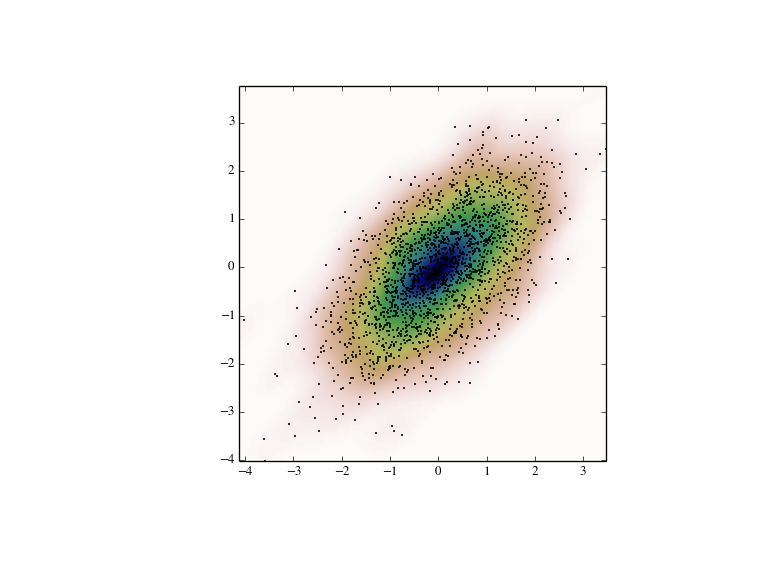 First we generate some random data with a model in which the two variates are correlated. ...     """Measurement model, return two coupled measurements.""" Finally we plot the estimated bivariate distribution as a colormap, and plot the individual data points on top. Last updated on Jan 11, 2015.